During this time of year, one of the most important articles of clothing for men is outer wear. This extremely important piece can either make your outfit POP or FLOP (so be careful)! In choosing this particular garment, men have many different shapes and styles to choose from; parkas, blazers, sweaters, sweatshirts, hoodies, topcoats, etc. and the list goes on and on and on. However, there is one specific type of outer wear that can be worn in multiple ways and make any outfit pop, while providing warmth, comfort, and style; The Denim Jacket. With this particular piece, you can wear it multiple ways; especially in the work place. Wear your everyday suit or business get-up from head to toe; dress shoes, slacks, button-up shirt, sweater, and tie, but just subtract your blazer and add your denim jacket. Guaranteed to turn heads while remaining in dress code. 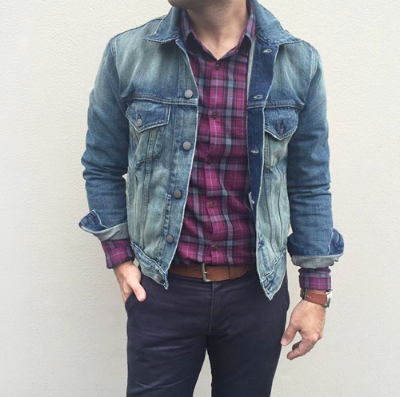 In case you don’t typically wear suits or slacks to work, you can take the less formal approach by throwing on your denim jacket with your casual outfit. Put on your favorite broken in khaki pants and tuck in your favorite fall plaid, or button up, shirt. The best way to dress down denim is to be a simple as possible. Where you best fitting black or blue jeans, with your favorite white kicks, a solid color t-shirt and your denim jacket. The dress down look should not take much effort. However, the goal is to look as if you put forth a lot of effort, even when you really didn’t. As the days are seemingly shorter and the weather is becoming a little more frigid, become well equipped with the seasons go to item; The Denim Jacket. If you don’t already have a denim jacket, be sure to search in various places; boutiques, online, thrift shops, and even your parents’ closet. You’d be surprised what great items you’ll find in the most unforeseen places. For more style tips, feel free to follow me on Instagram @Mister_Millage and @theMillage.